Schools around the country may be out for summer vacation, but that doesn't mean the learning has to take a break! Both educational AND fun, children's museums offer a great opportunity for a quick family outing...and bonus points for the grown ups when those same museums are said to be haunted! That's the case with North Dakota's Yunker Farm Children's Museum. The museum itself is located in an old farmhouse, built in 1876 by Newton Whitman. Whitman and his wife raised eight children and even built a schoolhouse on the property before selling to John and Elizabeth Yunker in 1905. The Yunkers were also very...fruitful. They raised ten children on the property, which stayed in the Yunker family until 1968. 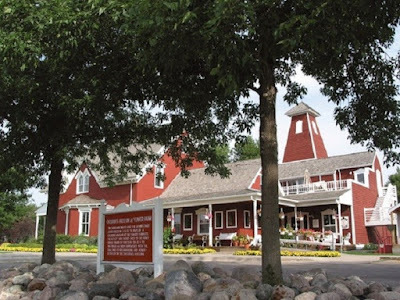 After the property was donated to the Fargo Park District, the old farmhouse eventually would become a children's museum. After four years of renovations, the Yunker Farm Children's Museum officially opened in November of 1989. A couple of different ghosts are said to wander the Yunker Farm property. The head ghost seems to be a woman, more often felt than seen. According to Rich Newman in the book, The Ghost Hunter's Field Guide, the staff have named this ghost, 'Vanessa,' but others feel that she is actually Mrs. Elizabeth Yunker. It is believed that Mrs. Yunker's love for children draws her to the second story exhibits, which are designed for the younger visitors. Staff members have reported sensing a friendly female presence in this area after closing. They believe that Mrs. Yunker is happy to see her former home being used as a nurturing place for children. Whomever the resident ghost may be, he/she/it is blamed for lights flickering on and off, an elevator that moves from floor to floor with no human hands working the buttons, and windows being found opened or closed with no one around to have touched them. There are also tales of another entity at the home, a much sadder tale than Mrs. Yunker coming back to monitor the activities in her old home. It is believed that a well on the property was the sight of a drowning death of a young girl. Unauthorized ghost hunters on the property have claimed to see the young girl, wearing all white, standing beside the well. It is reported that visitors to the well area may also experience feelings of shortness of breath or chest pains, which are believed to be the little girl's spirit showing them how she died. If you're in the area and you have young kids, definitely go check out this location and see if you can feel the friendly spirit of Mrs. Yunker. Stand by the well and imagine what some believe happened to a young girl in that very spot. But...you might want to refrain from asking about investigating the property. Apparently, staff prefer the ghost stories to be kept to minimum as to prevent children from becoming frightened of the museum.